In nineteen days our lives will all change for the better! We will get healthy and lose weight. We will stop smoking. We will stop gossiping. We will start going to church every week and reading our Bibles every day. We will aggressively pound the pavement till we find a job. We will end bad habits and start good ones. Are you making a New Year’s Resolution? I’m not. I used to, but I decided that I don’t like nailing down one specific area where I need to change. And I don’t like knowing I am probably going to fail before I start. Perhaps the real issue is that I am not resolute enough in my resolutions. I’m fine with wishful thinking or having a hopeful attitude, but keeping a resolution requires determination and a whole lot of inner fortitude. 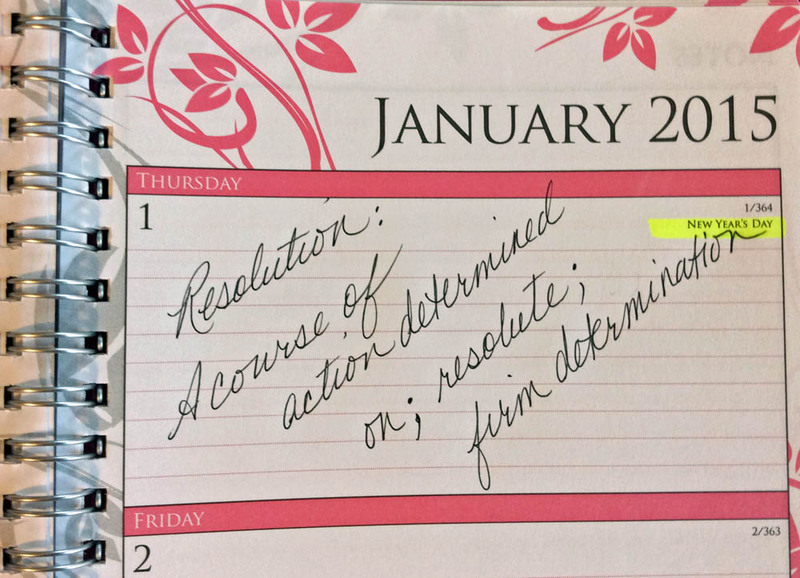 A resolution is more than a suggestion. Resolutions are about purposeful change. And purposeful change requires self-denial. Who wants to deny themselves anything? Whatever we want we’ll find a way to get. We manipulate, lie, cheat, steal, beg, borrow, flirt, cry, scream, or whatever else it takes to get what we think we should have. After all, we deserve the things we want. Self-denial isn’t easy and the alternative isn’t pretty. No one would ever describe themselves as self-absorbed, self-focused, or selfish. It’s so much better to think of ourselves as self-less! But if that were the case, though, Jesus wouldn’t have taught so much about self-denial. As a Christian, the place where your will for yourself intersects with God’s will for you is the place of your cross. It is that place of self-denial. When you lay down your will and take up God’s will for you, you are taking up your cross and following Jesus. And that requires purposeful change — a one-time resolution? Or an on-going way of life? For Christians, the changes God would have us make are not simply things we decide to try to change on January 1 and then cast aside on or about January 2 — change is our way of life. The Christian life is a life of purposeful change; it is a commitment to work with God so that we grow in holiness. What would Jesus have you throw off as 2014 ends and 2015 begins? Will this be the beginning of a life of purposeful change for you? If starting, or maintaining, a daily habit of quiet time is on your list of things for the new year, please give this devotional a try! What a great new name! Love it! Love you! Being a christian is not hard were making it hard. I have never made New Year’s resolutions as never seen anyone follow through!!! I just try to make improvements and learn from my mistakes, which are numerous!!! Thank God for forgiving us and giving us opportunities to improve along the way!!! Ditto, Janet! It’s almost like a resolution is permission to fail, as no one expects anyone else to keep them.